For more than 80 years, the law firm of Ritter, Robinson, McCready & James, Ltd., now with a branch office in Livonia, Michigan, has been offering legal solutions to insurance companies, political subdivisions and families. 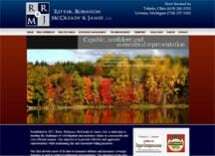 The firm serves clients throughout the Greater Detroit area and the entire state of Michigan. Ritter, Robinson, McCready & James, Ltd. represents clients in both the State and Federal Courts. Our experience runs deep. Our team of attorneys has more than 110 years of combined professional experience. Because of this depth, Ritter, Robinson, McCready & James, Ltd. can accept cases other small firms might refuse, complex litigation requiring experience, research and an extensive time commitment. When necessary, we are eager to proceed to trial but we strive to be creative in litigation and mindful of the cost associated with trying a case. It's small comfort to win a case if costs get out of hand. We are honored to represent some of the most respected insurance companies in the region and nationwide. In addition to insurance defense, we represent political subdivisions including, counties, cities, villages, and other public entities. Our firm has successfully defended clients in complex litigation including wrongful death and catastrophic injury claims. While our roots are in the past, we have readily adapted to technology advancements. As clients have gone paperless, so have we. It's a simple fact that our success as attorneys requires that our clients be economically robust as well. We keep our fees reasonable and justified, given the complexity of the work, and the advanced skills of our professionals. Capable, confident, committed: This is what we are at Ritter, Robinson, McCready & James, Ltd.